1. You can fly with an expired driver’s license for up to a year. HEY! Guess what I found out? My driver’s license needed to be renewed on my birthday in October. Who knew. Thanks to the TSA guy at Chicago Midway who pointed it out. And the other guy at Nashville’s airport who also pointed it out. Also, a good fun thanks to my friends at Facebook who inquired, “Hmmm… do you think your license is suspended now?” Clearly, I needed something to worry about while I was out of state and powerless to do anything about it at the time. But no worries – I’m renewed now. What a way to kick off my Monday, though. 2. Rescue Remedy? It works. HOLY MOLEY, does it work. You know I’m afraid of flying, so it shouldn’t surprise you that I sought remedies for my fear so that I wouldn’t get too wigged out on the plane. Rescue Remedy can be taken by itself or in water. On the way down – I didn’t take nearly enough (the woman at the healthfood store said “four drops” — the website I linked to says ten). The way back? Four drops before my flight, another few while ON the flight, and I was calmmmmmm. So calm that I didn’t even get road-ragey driving home from Chicago to Michigan. That’s saying something. 3. There are approximately 153,206 ways you can get lost at the Opryland Hotel. I put a lot of miles on my feet this weekend. The hotel is HUGE. It’s gorgeous and huge and a little bit confusing. 4. Barbecue pulled pork on buttermilk biscuit sandwiches are the BEST. SANDWICH. EVER. 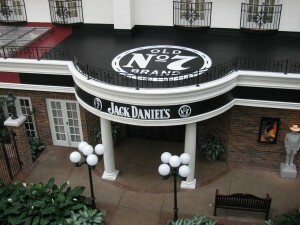 Thursday night’s cocktail party was held at the Jack Daniels restaurant. Drinks and hors d’oeuvres (Yes, I just googled the spelling of that. Shut up). The food was awesome, but these sandwiches? Well, I guess you just have to understand how much I love barbecued pulled pork to understand how full of AWESOME these sandwiches were. No joke. I only bought this stuff because it was in the trial size section at Target and met two of my criteria – under a buck (for the travel size) and made for curly hair. First of all, it really shaped curls well. Secondly, I am not sure if I have ever had so many people sniff my hair and say it smelled good. So, there. Well done, Frizz Ease. I will opt not to complain about my travel-size deodorant choice (BOO!) and the cheap razors I bought (Also – big freaking thumbs down says the gouge on my right leg). Seriously, I don’t even know what they did to make it taste like that, but of all the food I ate in Nashville (AND THERE WAS TIRAMISU FOR GOD’S SAKE!) I would go back and eat those sandwiches again. Like… four of them. Your hair did smell especially awesome! Bridget, I’m SO glad I got a chance to hang out with you! That picture I took of you at Tastemaker danceoff dealy-boo is one of my favorites from Nashville – you look SO carefree and happy! Love it. Your hair SMELLED SO GOOD. You hair looked amazing all weekend. I thought you would have added a #6 “How many ways I maimed myself with inadament objects”. *snort* You know I love you the mostest!! You made me TOTES jealous that I wasn’t there! Glad the rescue remedy worked! WOOT! Thanks for the frizz-ease tip! I recently decided to TRY to embrace my crazy curls, and have been looking for products to use. Also, have you ever put cole slaw on your pulled pork sandwiches? OMGHeaven. I thought it sounded gross until I moved to NC and tried it… now I can’t imagine them without it!